may you find the peace and health you so richly deserve. • "It Was All So Stupid"
Ranked among America's Top Surgeons & Gynecologists, Tamer Seckin, MD has established himself internationally over the course of more than two decades as a leading specialist in Advanced Laparoendoscopic Surgery for the treatment of endometriosis and associated pelvic pain pathologies. Dr. Seckin is among a very limited number of accredited gynecologic surgeons in the United States who possess advanced training for the deep excision of endometriosis. Although others perform basic laparoscopic surgery, few have the experience necessary to execute the meticulous techniques required to sharply dissect and remove all disease from superficial to deeply infiltrating and fibrotic. 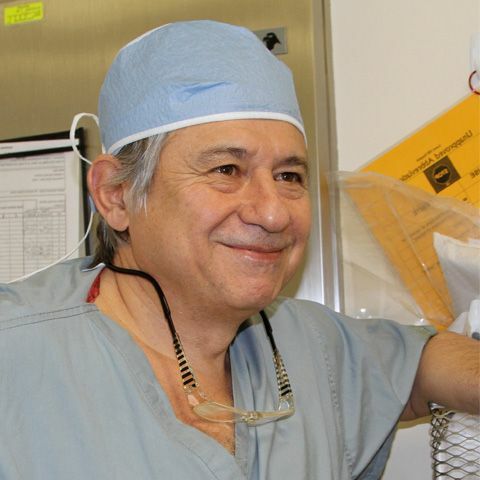 Throughout his career, he has successfully treated thousands of women and girls with endometriosis and associated pelvic pain pathologies. The majority of his patients have experienced long-term relief and no recurrence of the disease. "Dr. Seckin blends his knowledge and surgical skills with compassion and understanding of patient concerns. His many years of hands on experience and patient interaction combine to make this book a very worthwhile read." 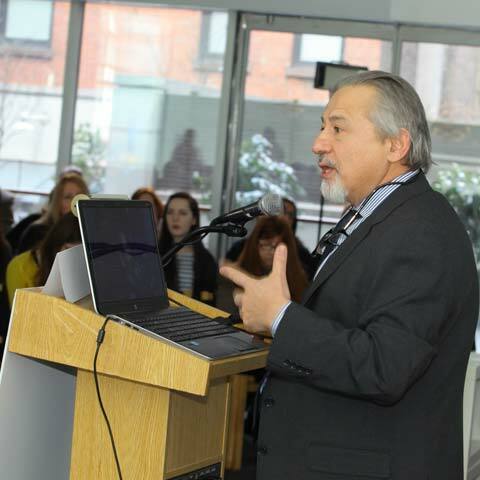 "Endometriosis cripples women without a proper diagnosis. 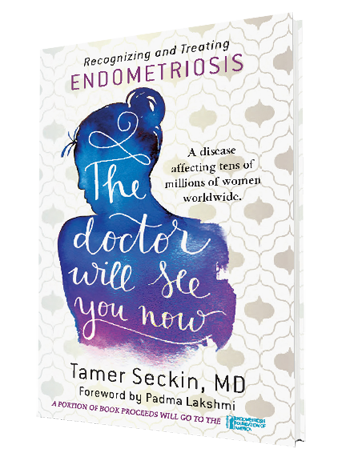 Dr. Tamer Seckin's The Doctor Will See You Now sheds light on this painful condition and advances the fight to help women with endometriosis through personal accounts and his breadth of knowledge. 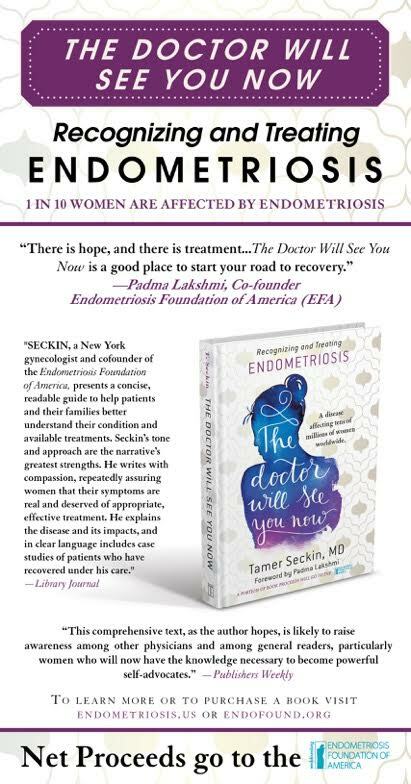 I've worked with Dr. Seckin's co-founder of the Endometriosis Foundation of America, Top Chef star, Padma Lakshmi, to help women understand that there is hope and I know this book will do the same." "One of the best endometriosis surgeons is Dr. Tamer Seckin, a premier gynecologist specializing in endometriosis. Throughout my practice and teaching career, I have personally observed numerous top surgeons, both in Europe and North America, performing difficult endometriosis surgery in their operating rooms and, without hesitation, I can recommend Dr. Seckin as one of the best of the best." TO THOSE AFFECTED IN ANY way by endometriosis: I know the pain you’ve been battling. You hurt, a lot, more than anyone else can comprehend. You feel alone and hopeless. You’re physically and mentally drained, nearing your breaking point, if you haven’t reached it already. You’ve tried repeatedly for years to get someone, anyone, to listen to you, to understand what you’re going through—a friend, a family member, a school nurse, even a doctor—but they don’t. They dismiss your issue as a “girl problem” or a “woman thing,” as a disease or condition that it’s not, or as something that will magically fix itself over time. They couldn’t be more wrong; you know it in your gut, and I know it for a fact. I know it, not due to experiencing this pain myself, but because I was taught by listening to my patients. To the woman who has had multiple surgeries without symptom relief: You deserve better treatment, and there is better treatment. Your doctor is probably giving you the best care he or she has been trained to give, but there are better options that you haven’t tried, options that can end your suffering.